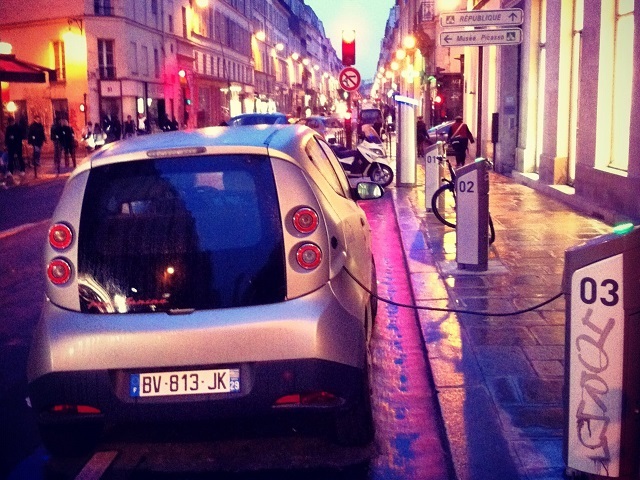 An electric, shared vehicle from Paris, France’s Autolib’ car-sharing service charges at a docking station. While still primarily concentrated in North America and Europe, car-sharing is steadily becoming an increasingly globalized industry. Photo by Cokul/Flickr. This is the seventh post of the “Sustainable Urban Transport On The Move” blog series, exclusive to TheCityFix. Preparation of this series was possible thanks to a grant by Shell Corporation. Its contents are the sole responsibility of the authors. In a trend emblematic of the notion that “access trumps ownership,” a growing number of individuals worldwide are choosing to share cars rather than own them. Car-sharing is a membership-based, self-service system with a network of stations and vehicles that provides an alternative to traditional car ownership. Although car-sharing is fairly limited from the perspective of overall mode share – less than 1% of the urban population’s licensed drivers currently participate in a car-sharing program – it is quickly developing into a globalized industry. By providing access to private vehicles only when users need it, car-sharing renders the purchase of a car effectively unnecessary. Over the past three decades, car-sharing has grown from a basic service provided by grassroots organizations to a widely recognized, transformative urban transport industry. 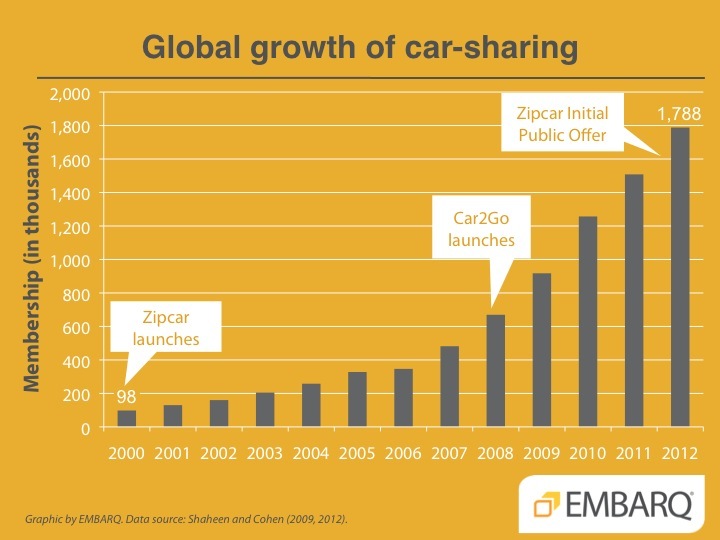 Unlike expansions in mass transport systems, which are typically spearheaded by governments, the growth of car-sharing was initially driven by private organizations like Zipcar, Greenwheels, and Car2Go. Modern car-sharing was born in Switzerland and Germany in the 1980s, introduced to North America and Asia in the 1990s, and steadily gained global popularity during the first decade of the 21st century. In 2009, the number of cities with car-sharing systems topped 1,000. As of October 2012, 1.79 million customers were sharing nearly 43,550 vehicles in car-sharing systems across 27 countries and five continents, signaling that the rate of growth for this relatively young industry is increasing rapidly. Although North America and Europe currently account for about 90% of car-sharing memberships and fleets, car-sharing has quietly taken hold in several cities located in emerging economies, including São Paulo, Brazil (2009); Beijing, China (2009); Hangzhou, China (2011); Istanbul, Turkey (2011); Mexico City (2012); and Bangalore, India (2013), among others. Car-sharing operators in emerging economies are generally quite small – EMBARQ research found the largest had just 60 cars as recently as August 2012 – but some are growing quickly, particularly in Mexico and China. For example, Hangzhou’s EVnet increased its number of stations from 13 to over 50, and membership from 1,300 to 4,000, in a single year. 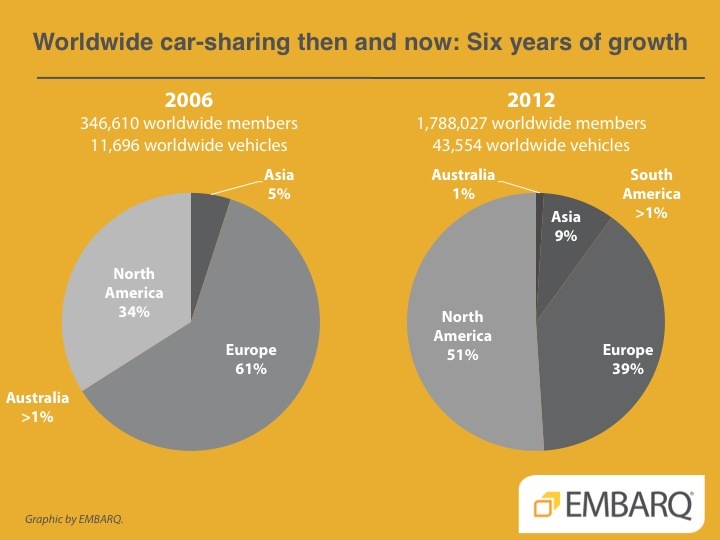 Worldwide car-sharing then and now: Six years of growth (2006-2012). Graphic by EMBARQ. Data source: Shaheen and Cohen (2013). The most common model of car-sharing operation is a two-way model, which requires customers to borrow and return vehicles at the same station. This model has proved to have positive social and environmental impacts, including reducing the need for private vehicle ownership in the first place. One shared, two-way vehicle could replace six to 23 private vehicles in the United States, and four to ten private vehicles in Europe. Shared, two-way vehicles can also help reduce vehicle kilometers traveled (VKT) by anywhere from 28% to 45% in Europe and by an average of 44% in the United States. Due to these benefits, two-way models have received governmental support in Europe, North America, and Australia, largely through free or subsidized on-street parking, enabling car-sharing to significantly scale-up in these regions. Peer-to-peer and one-way models are more recent developments in the car-sharing industry. In peer-to-peer systems, shared vehicles are owned by individuals, thus leveraging the existing stock of private vehicles. The first system to implement this model, RentMyCar, was launched in 2001. By October 2012, 33 peer-to-peer car-sharing operators were operational worldwide, and their vehicle total reportedly surpassed 50,000 in January, 2013 – more than one-way and two-way systems combined, though peer-to-peer vehicles tend to be shared only a fraction as much of the time. The rapid growth of peer-to-peer fleets is fairly easy to comprehend from a practical standpoint – this model does not require an initial investment in vehicle purchases. However, its viability remains uncertain. Whipcar, formerly one of the largest peer-to-peer car-sharing operators based in the United Kingdom closed in March, 2013 citing limited resources and barriers to expansion. While many experts still find this model promising, Whipcar’s failure indicates the many risks associated with it. One-way car-sharing systems – a model that allows customers to pick up a vehicle at one location and drop it off at another – have experienced astonishing growth and profits in recent years. In 2012, Car2Go and DriveNow made up a combined 11.7% and 18.4% of membership and fleets in North America, respectively. Today, Car2Go boasts 9,000 vehicles in 25 cities in eight countries, and DriveNow has expanded to five cities with 1,600 cars, positioning the one-way model for continued growth in the coming years. 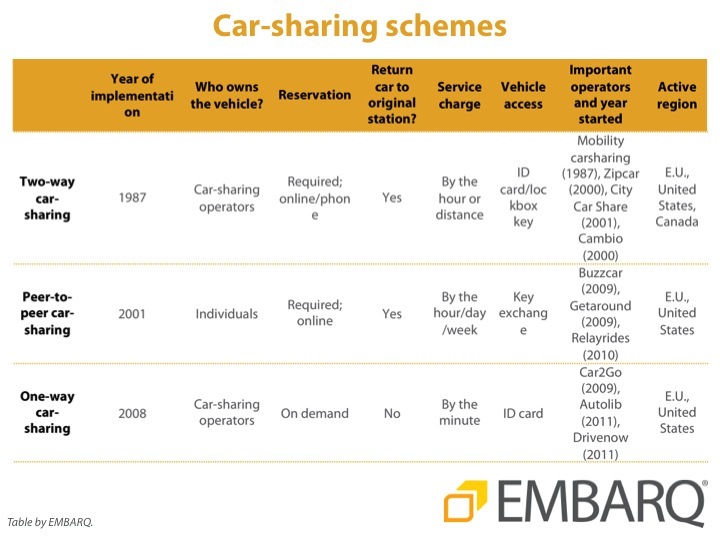 Various car-sharing schemes and their characteristics. Graphic by EMBARQ. More players, more profits, more impact? Recently, new players from the automotive industry have joined the car-sharing movement, including Enterprise, Hertz, and General Motors. Just this year, Avis purchased Zipcar, Enterprise acquired IGo, and Volkswagen gained a 60% stake in Greenwheels, suddenly turning car-sharing from a grassroots dominated field to an industry controlled largely by automakers and vehicle rental companies. This scaling-up of business transactions in the car-sharing industry indicates that it is at the tipping point of becoming a mainstream mobility option. Moving forward, a recent study predicted that by 2020 global car-sharing membership will reach 20 million, while the fleet will increase to 500,000. This impressive predicted growth and the ever-changing nature of car-sharing raise many important questions we should explore in order to better integrate this option with urban mobility systems: What will the impacts of corporate-led car-sharing be? How will the impacts of peer-to-peer and one-way models compare to the classic two-way model? Most importantly, might developing countries – the locale of most growth in private motorization and urbanization – offer a huge scaling-up potential for car-sharing? Clayton Lane, Dario Hidalgo, Ryan Schleeter, and Kyle Mackie also contributed to this blog.